Me, too, Bee, me, too. Guarded by hundreds and thousands. Yet men come often to seize my gold. Then left to build my treasure anew. Bees – honey bees, not bumble bees – were introduced to this continent. We don’t tend to think of them as invasive, because without them the apple trees (introduced) and orange trees (introduced) and many other fruits and veggies would just not thrive. 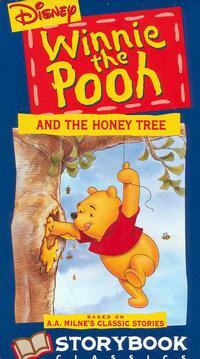 And without honey bees we’d have no golden treasure of honey. Slice, chop and mix together. Mix the honey and vinegar into the mustard. Drizzle the oil in until all blended. Pour over the sliced/chopped radish and celery, toss well. Other add ins or leave outs – chopped shallot or onion or minced garlic – just to season. A little shaved Parmesan or Romano cheese is good, too. I eat this alone; on crackers; on a bigger leafier salad; on a microwaved baked sweet potato…did you know that salads started out as condiments? When the baby greens and radishes start coming out, I cut the honey out…an sometimes the dressing altogether. No, not scookies, or even s’cookies, but S cookies. 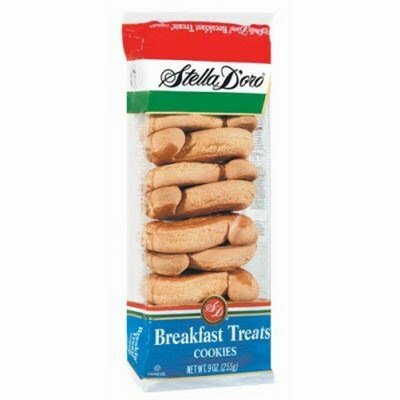 Cookies in the shape of an S.
Stella D’Oro Breakfast Treats are technically an S cookies – but these aren’t the ones I mean. This time. And being Italian, there’s more then one…. 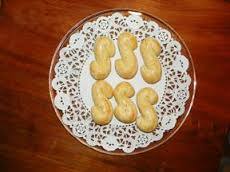 S cookies….I’ve already lost track and we’re not even out of the ‘A’ varieties…. 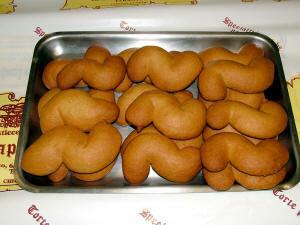 The cookies I’m taking about are also known as Susameille. Or Susamelli. Or Suziemella. Or Suzie Cookies. These are my favorite cookies of the Christmas Season. I’ve discovered several versions of them and several versions of the back-story as well. First, a cookbook version. Preheat oven to 375°. Grease baking sheets. Mix molasses, oil, egg, sugar, salt, pepper and orange rinds. Blend well. Add flour to form a dough that can be rolled. Oil fingers. Take pieces of dough and roll like a pencil. Place a sliced filbert on the top and bottom of the S.
Bake about 15 minutes, until just brown. From Anna Tosti Goodman, Lake Worth/Boynton Beach Lodge #2304. 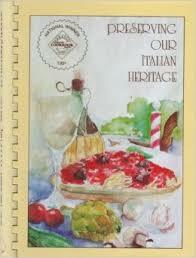 In Preserving Our Italian Heritage. A Cookbook. Sons of Italy Florida Foundation. 1991.p. 178. 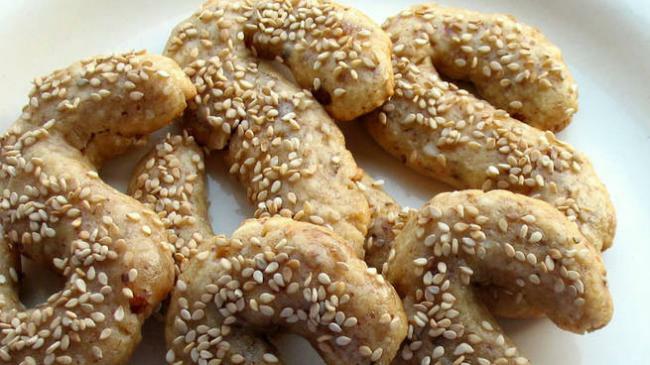 First, in the past they were called sesamielli, and covered with sesame seeds. Second, they were (and are) called Sapienze, because they were made by nuns of the Monastero della Sapienza. This is already longer and more confusing then I want it to be. And there’s more. My back-story version. These are the cookies that my Auntie Anna made at Christmas. She’s the one who passed the recipe down to various of us. Auntie Anna got the recipe from my Nonna. These were the cookies she used to make. Please note: Nonna died before I was was two, so I only know Auntie Anna’s version. Working with honey can be tricky. 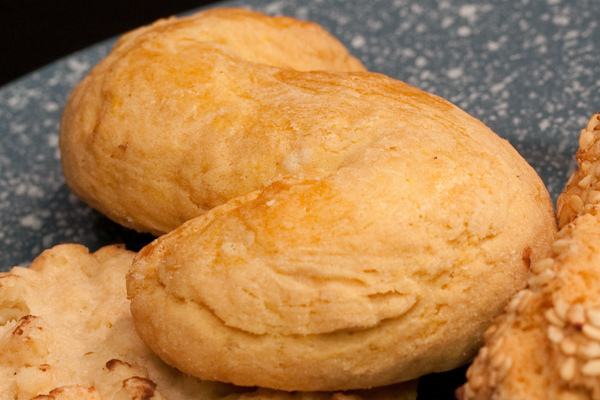 Auntie Anna’s recipe gave all the right ingredients, but technique is something else altogether. Auntie Anna’s brother Cosmos LOVES these cookies, and since his birthday is December, his wife Jane has been making these cookies for decades as well. Jane’s version appeared in Lo Specchio, the newsletter of the ITALIAN GENEALOGICAL SOCIETY OF AMERICA back in Summer 2001. The version I’m using is based on one Auntie Anna shared with me, and my cousin Flora, and Flora and I talked together and then I made them some more…. In a large bowl, mix liquid ingredients together. Wash and peel tangerines. Cut peel into small dice and add to liquid ingredients. Gradually add the dry mixture to the liquid one until it is all well blended. Refrigerate for at least 2 hours and up to 24 hours. When ready to bake, preheat oven to 350°. Shape dough by rolling walnut sized pieces between oiled hands (I fill a small saucer with oil to dip my palms in – think Kim Kardashian backside oiled…pretty slick indeed) and shape into an S.
Put on a prepared cookie sheet – We’ve been using the no stick Reynolds wrap to good success- these can bake up sticky. Put three almond halves in the crooks. They shouldn’t brown – just be firm. From my Auntie Anna, more or less, and commentary from just about everyone else. This is from a bakery in Connecticut – I didn’t realize the 2 images were joined. By next Christmas I will be taking my own pictures! Any way you try them, S Cookies are S’wonderful! Have a honey of a New Year!